Kundan embroidery on fabrics is highly sought after as the richness it bestows to the fabric is virtually unmatched by anything else. Kundan embroidery is an amalgamation of Zardozi and Kundan work. The basic process used is where after the completing the Zardozi embroidery using gold and silver threads, gemstones and pearls are studded on to it. Kundan on fabrics goes back to the Mughal era where it flourished under royal patronage in Rajasthan and Gujarat. Artisans from all over the country converged to Rajasthan to learn and perfect this art. 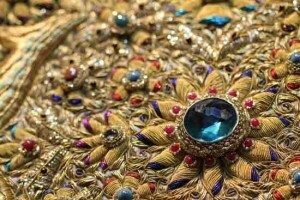 However, just like Zardozi, this art also floundered due to the increasingly high costs of gold and gemstones.It is believed that in the late 19th century, Kundan jewelry and Kundan work on fabric came back into the limelight when artisans started using semi-precious stones, pearls and silver along with the modified materials of Zardozi. More than Kundan embroidered clothing, Kundan jewelry by itself is a distinguished work of art considered a once in a lifetime gift. More often than not, a bride is adorned with Kundan jewelry and clothes with Kundan embroidery on her wedding. While Jaipur and Bikaner continue to be the centres of traditional Kundan jewellery, today the main centres for creating Kundan embroidery are Delhi, Agra, Lucknow, Bhopal, Ajmer, Mumbai, Kashmir and Chennai. Making Kundan jewelry is an intricate process. It involves shaping of the jewelry by craftsmen followed by making of holes for the stones and then the jewelry pieces are enameled. Some lac is applied on the back of the jewelry piece which can be seen through the holes created. Then gold is used to form a covering layer over the lac and finally, the stones are set onto the gold. Furthermore, gold is applied around the edges giving it a neat appearance. 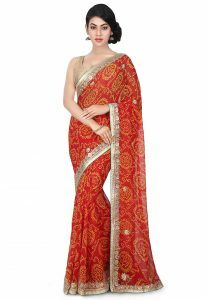 The preferred fabric for Kundan embroidery is Silk, but with several innovations being made in Indian fashion, even Georgette and Chiffon fabrics are being used now. For the Kundan jewelry work, there are a set of specialized craftsmen who carry out specific tasks. The Chiterias are the people who provide the basic design. The Ghaarias carry out the engraving process and they also make the holes. In case of Meena Kundan, the enameller does the Meenakari work and finally the goldsmith does the work with gold setting. Finally the Jadiyas (stone setters) set the stones into the gold. Nowadays, there are varieties of Kundan jewelry which use silver as the main base so as to make it more affordable for people across the globe. The same applies for Kundan embroidered clothes too. Beautiful outfits of Kundan work like designer sarees, lehengas and other Indian dresses are also made by artisans in Rajasthan. Sarees with Kundan work embroidery often form part of the bridal finery at weddings. Be it wedding lehengas or bridal sarees, Kundan forms an essential part of the embellishments. They are also worn on many formal occasions. For fabrics with Kundan work, the recommendation is to dry clean them. For storing them, it is suggested that the Kundan work be covered with Velvet and stored in a dry place. Outfits with Kundan work are showcased regularly in Hindi movies by leading ladies. In Jodha Akbar, Aishwarya Rai was seen flaunting Kundan jewellery, dressed as a Rajputana princess.